Eastern subterranean termites are found from Ontario southward and from the eastern United States seaboard as far west as Mexico, Arizona and Utah. Termites are social insects, which live in large colonies. There are three castes: swarmers or reproducers, workers, and soldiers. Termite antennae have bead-like segments. The winged swarmers have a pair of equally sized long wings that are attached to the last two thoracic segments. The wings break off after swarming. The abdomen is broadly joined at the thorax unlike the narrow abdominal attachment found on ants. The winged swarmers are dark brown to almost black and about 3/8-inch long. The wings are brownish gray with a few hairs and two dark veins on the leading edge. They have a very small pore on their heads. The soldiers are wingless with white bodies, rectangular yellow-brown heads that are two times longer than their width, and large mandibles, which lack teeth. Subterranean termite colonies usually are located in the soil from which the workers build mud tubes to structural wood where they then feed. Subterranean termite colonies are always connected to the soil and/or close to a moisture source. 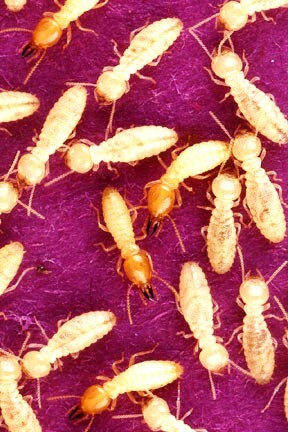 Termites digest cellulose in wood with the aid of special organisms within their digestive system. The workers prefer to feed on fungus-infected wood but readily feed on undamaged wood as well. The foraging workers feed immature workers, swarmers, and soldiers with food materials from their mouths and anuses. A mature queen produces 5,000 to 10,000 eggs per year. An average colony consists of 60,000 to 250,000 individuals by colonies numbering in the millions are possible. A queen might live for up to 30 years and workers as long as five years. Subterranean termite colonies are established by winged swarmers/reproducers, which usually appear in the spring. Swarms usually occur in the morning after a warm rain. 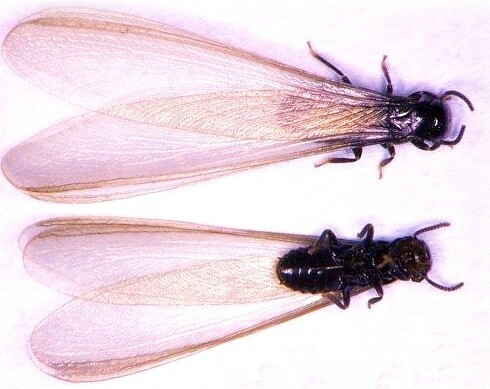 A male and female that have swarmed from an established colony lose their wings and seek a dark cavity inside which they mate and raise the first group of workers. Both of these swarmers/reproducers feed on wood, tend to the eggs, and build the initial nest. After the workers mature, they take over expanding the colony and feeding the swarmers, as the colony becomes larger, light colored supplementary reproducers are produced to lay eggs, which then become workers. The soldiers, which are also produced as the colony increases in size, are responsible for repelling invading ants and other predators.